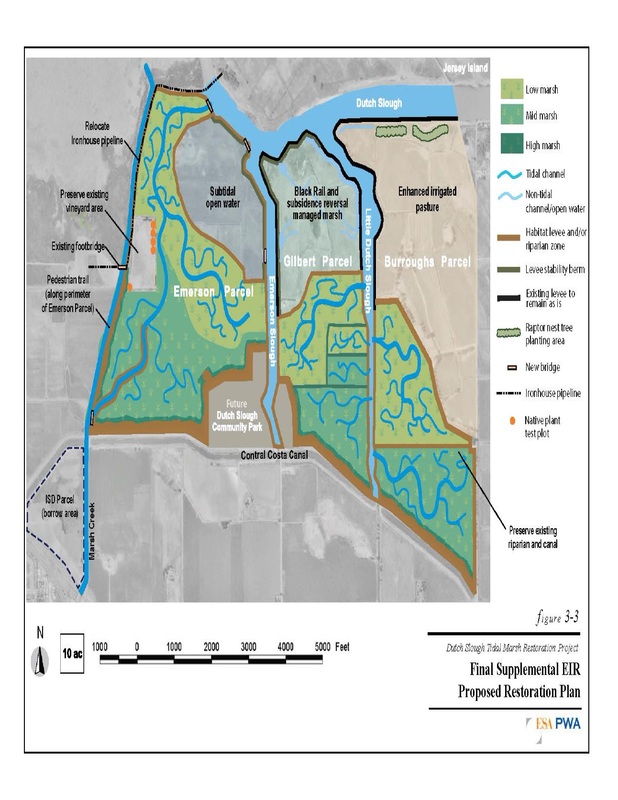 The Draft Environmental Impact Report (Draft EIR) for the Dutch Slough Tidal Marsh Restoration Project in Oakley addresses the potential environmental impacts of the Project. The Project entails wetland and upland restoration and public access to the 1,178-acre Dutch Slough property owned by the California Department of Water Resources (DWR). The property is comprised of three parcels separated by narrow man-made sloughs. Currently each parcel is leased for grazing. DWR has finalized and posted the Final Supplemental EIR (SEIR) for the Dutch Slough Tidal Marsh Restoration Project and the Response to Comments, the latter containing all the comments received during the public comment period and DWR’s responses. Since the certification of the 2010 EIR, a number of changes have been made to the Project design and proposed construction methodologies that may affect the analysis of impacts provided in that document. The Dutch Slough Tidal Marsh Restoration Project proposes wetland and upland restoration and public access to the 1,178-acre Dutch Slough property owned by DWR. The Project seeks to restore habitat for native fishes and other aquatic and wetland species, improve the understanding of restoration science in tidal marsh wetland ecosystems in the region, and provide public access to the restored area. A new Marsh Creek channel network would also be constructed through the Emerson parcel to discharge into Dutch Slough. Most (approximately 13.4 acres) of the vineyard on the west side of the parcel would be preserved to protect historical, prehistoric, cultural, and agricultural values. This entry was posted in City Info, City Parks, Oakley Vines. Bookmark the permalink. I am happy that the community was able to preserve the Emerson/José Vineyard. I think it is important to save this important cultural link to the past.